This page is designed to provide extra added little bonuses to support the AURORA SERIES. Keep checking back here from time to time, because you never know when there will be more! 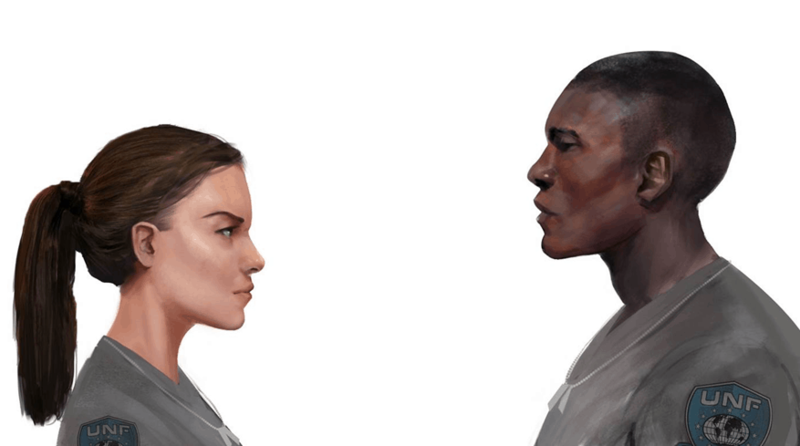 Blog: A Vision of Captain Saul Harris and Corporal Carrie Welles <<< Here I talk about my decision to hire an illustrator to bring Carrie and Harris to life visually. Corporal Carrie Welles and Captain Saul Harris of the UNF Aurora – Illustration by Damian Audino. Starmap of the UNF Space Zone. Welcome to the world of Captain Saul Harris and Corporal Carrie Welles. They are soldiers enlisted in the United National Forces, which consists of two divisions: Earth Duty and Space Duty. The UNF was created to not only protect the Earth, but oversee and secure the space migration. Human populations now dwell on the many stations floating off Earth, the five colony settlements based on the Moon, and the developing colonies on Mars – the new frontier. The ‘UNF Space Zone’ covers the entire area of inhabited space as controlled by the UNF. This is the world that Harris and Carrie have sworn to do their duty and protect. Blog: Beyond The Page | Graphic Evolution <<< Here I talk about the process to design the UNF Insignias and Pegasus emblem.